This page is dedicated to information on training missions and exercises by the US Navy in preparation for the recovery of astronauts. A story by Daniel A. Bernath, Apollo 8 and US Navy Photographer's Mate, Petty Officer 2nd Class on the website http://www.yorktownsailor.com/ tells the story of another training exercise. The following photos were part of the story. picture in front of the practice capsule. The site also contains a lot more information, pictures and links to videos of the actual recovery of the Apollo 8 astronauts (http://www.yorktownsailor.com/yorktown/apollofirst.htm). "there were several types of simulations or practices - one by destroyers or oilers operating alone, one by the ARRS with aircraft and pararescue and one by the designated primary ship with helos and swimmers. Destroyers/Oilers - usually they practiced near their home ports or once underway to their assigned station. Normally they would place the BP (boilerplate) over the side sail some distance away and then make the tricky approach to bring the BP along side to attach the retrieval line and hook and bring the BP aboard. Depending on sea state and skill of approach some times the ship could bring the BP close enough for sailors to latch onto the recovery loop on the BP ( using a special line transfer device) and lift the BP aboard with the specially designed davit crane secured on the fantail. Because the destroyers or oilers normally did not operate with aircraft or helos they did not sail far away from the BP during a practice. It was more difficult for the oiler because of the larger distance to the waterline and they usually placed a whaleboat in the water to assist in slowly towing the BP along side the ship. I have seen destroyers conduct retrievals with and without placing a whaleboat in the water to assist. 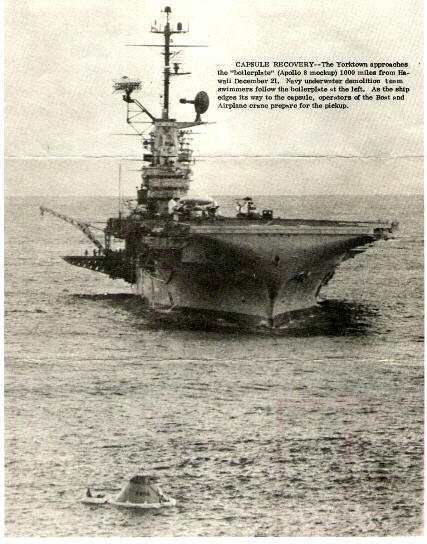 ARRS - a "full-up" simulation required a ship with retrieval capability to take a BP out to sea. The BP would be equipped with flashing light and electronic beacon. This equipment enabled the NASA engineers involved to train the DoD personnel in the operation of the SARAH device (emits a homing signal) we placed on support aircraft. Once the BP was located ( homing on the beacon signal) the aircraft and PJs (Pararescue Jumpers) began their preparation sequence for jumping. 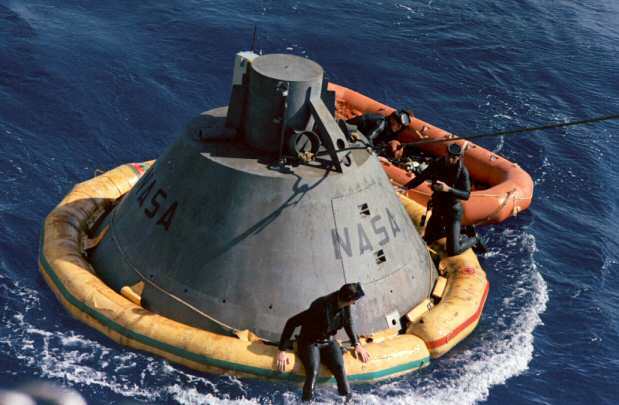 Since the Apollo had a fairly high drift rate the prep sequence was somewhat difficult requiring smoke signal drops, precise rafts and flotation collar drops. If not done precisely a PJ missing his target possibly would not be able to catch up to a drifting BP. The PJs would gather the dropped equipment, install the collar and await the ship to return all to base. recall correctly the Apollos landed close enough to the primary ships that the landings were within sight. (not always the case with the Mercurys or Geminis). As the ship approached the BP (swimmers riding on the collar or in their rafts) a line would be shot to the swimmers and a line would be attached to the BP and the BP hauled toward the ship to a position beneath the B&A crane (Boat & Aircraft crane). A whaleboat may or may not be in the water to assist." The DOD and NASA carried out many training missions in preparation for the actual recovery missions. Very little has been recorded about these missions. Even the dates of most have not been noted expect in the logs of the ships involved and possibly obscure DOD archives. The following is a list of know missions. 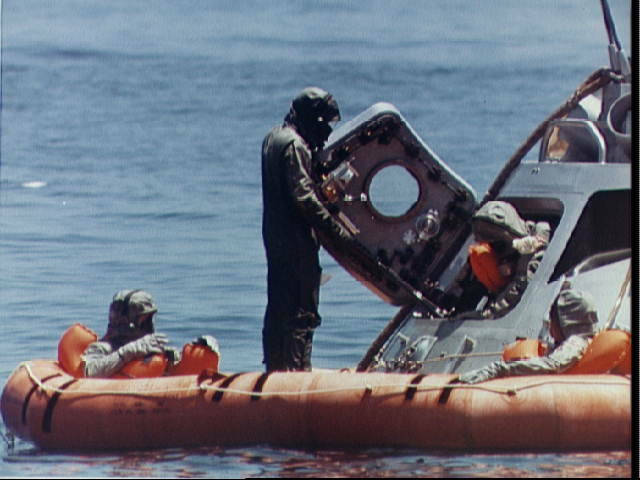 Apollo command module boilerplate floats in the Atlantic Ocean during a practice recovery exercise. Frogmen in a liferaft and on the flotation collar secure the command module boilerplate for hoisting onto a nearby recovery ship. The exercise was conducted in preparation for the forthcoming Apollo-Saturn 201 AS-201 mission. While NASA reports the mission as training for Apollo 9 and the cover is marked as training for Apollo 10, the mission was actually a training exercse for quarantine procedures for the first Moon landing mission, including the use of the Apollo quarantine trailer. Eventually, this turned out to be Apollo 11 but at the time there was speculation that the first Moon landing would be Apollo 10, hence the cover's caption. The third member of the Apollo 11 crew egresses Apollo Boilerplate 1102 during training in the Gulf of Mexico. The other two crewmen are in raft. The three crewmen practiced donning and wearing biological isolation garments (B.I.G.). A website devoted to the USS New has photos of the Destroyer recovering a boilerplate capsule.